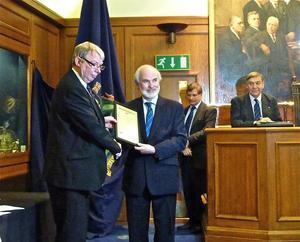 The National Oceanography Centre (NOC) and its partners featured strongly in the Society for Underwater Technology’s 2010 awards, which were recently presented at the SUT Annual General Meeting onboard the Guild of Master Mariners Headquarters Ship Wellington. SUT Past-President David Brookes, standing in for SUT President Dr Colin Summerhayes, found that reading even a summary of Dr Flemming’s scientific and committee output over the last four decades took several minutes. Nic also delighted the audience with anecdotes from his long career. Gary Momber of the Hampshire and Wight Trust for Maritime Archaeology, based at NOC, was awarded a Fellowship of the Society for his services to marine archaeology and scientific diving, and Stephen Hall from the National Marine Co-ordination Office, also based at the NOC, was declared the Honorary Secretary of the SUT, succeeding Moya Crawford of Fife-based salvage firm Deep Tek Ltd.